Marine Calvin Riggleman is a large man with a huge smile. He served two tours in Iraq. 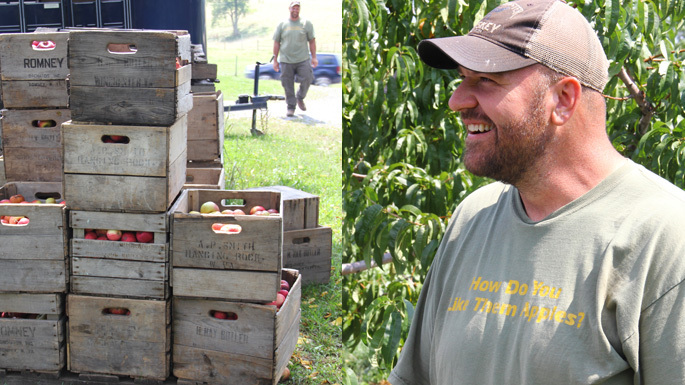 I came across his farm in the heart of West Virginia where he is growing all kinds of produce – from apples and peaches, to kale, tomatoes, and squash. He comes from a long line of farmers – his family has been farming this land since the American Revolution. Calvin was an Army Ranger and served several tours of duty in Iraq and Afghanistan. He came home after that and eventually found farming, first with lamb and sheep, then with pigs. He has such a wonderful way about him, so caring, tending to his animals. Thinking of him, I’d like to offer up my Apple Strudel recipe. Calvin grows apples of all kinds but for this recipe I like to use Granny Smith’s. Calvin also makes his own moonshine. For this recipe though, I just use rum. Enjoy! And to meet Calvin, tune-in to Lidia Celebrates America – Homegrown Heroes – December 15, 2017 at 10pm. (check local listings). Use a fine grater to remove the zest from the lemon. Squeeze the juice from the lemon, strain it if necessary, and combine the juice and zest in a medium-size mixing bowl. Melt half the butter in a medium-size skillet over medium heat. Add the bread crumbs and toast, stirring constantly, until lightly browned, about 5 minutes. Remove the skillet from the heat and stir in ½ cup of the sugar and the cinnamon. Add the remaining cup of granulated sugar and the rum and raisins to the bowl with the lemon juice and zest. Peel the apples and cut them into ½-inch-thick wedges, cutting away the seeds and cores and adding the wedges to the bowl of the lemon-sugar mixture (to prevent them from darkening). Let the apples stand, tossing occasionally, until the sugar begins to dissolve and the apples are coated with the syrup. Preheat the oven to 450 degrees F and brush a large baking pan with olive oil. Lightly flour a large, smooth wooden or marble surface. Using a rolling pin, roll out the dough from the center to the edges into a very thin rectangle. As it gets thinner, you should be able to pull and stretch it gently with your hands to coax it into the shape you want. Don’t worry if the dough tears a little in spots—you can patch it later—or if it doesn’t form a perfect rectangle. Turn the dough so one of the longer sides facing you. Place a kitchen towel or length of double-thick cheesecloth under the entire far side of the dough rectangle by about 4 inches. (This will help you move the strudel to the baking sheet once it is formed.) Spread the bread crumb mixture evenly over the dough, leaving a clean 1 1/2inch-wide border on all sides of the rectangle. Dot the bread crumbs with small pieces of the remaining ¼ cup of butter. Arrange the apple mixture in a long mound along the side closest to you. The mound of apples should measure about 4 inches wide and as long as the bread crumb mixture, leaving the 1 ½ inch-wide border clean. Fold the clean border closest to you over the apples. Begin rolling the strudel into a fairly tight roll, starting at one end of the apple mound, giving it a half-roll and gradually working your way down the roll. Don’t worry if the roll is uneven or tears in places. You should end up with a fairly even, lumpy looking roll that is centered, seam side down, on the kitchen towel. Use the towel to transfer the strudel to the prepared baking sheet, bending the strudel into crescent shape if necessary to fit it on the pan. Cut off any excess dough from the ends. 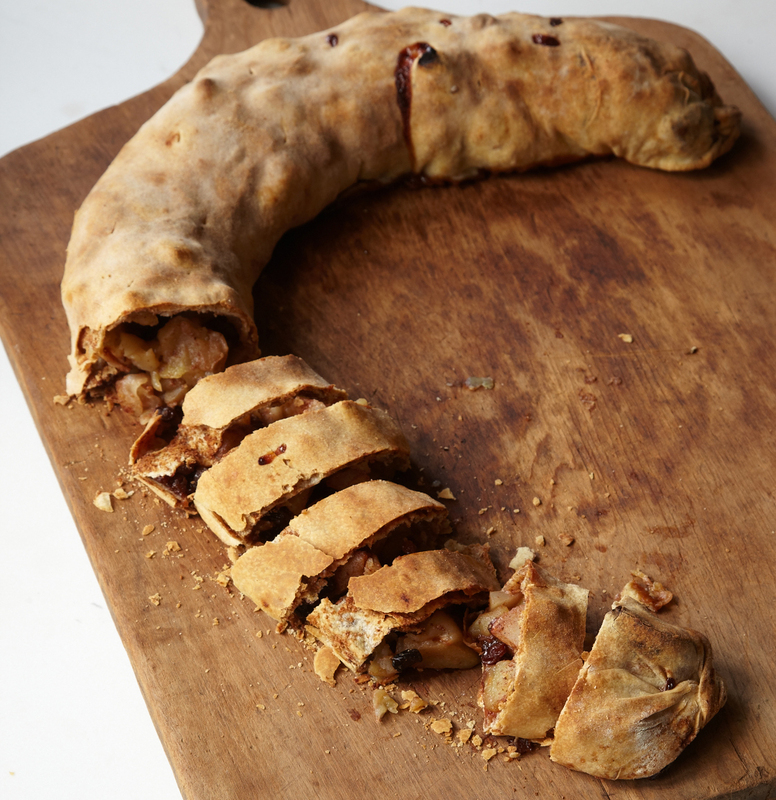 Seal the ends of the strudel by folding the ends of the roll underneath and pressing them firmly with your fingers. Brush the strudel lightly with olive oil and place in the oven, then immediately reduce the oven temperature to 375 F. Bake 30 minutes, until the top of the strudel is a light golden brown. (If deeper in color than that, reduce the temperature to 350 F.) Rotate the baking pan in the oven so the strudel cooks evenly, and continue to bake until the strudel crust is deep golden brown and firm, about 30 minutes. Remove the strudel from the oven and let stand until completely cooled. To serve, cut the strudel into 1-inch-thick slices and sprinkle them with confectioners’ sugar.